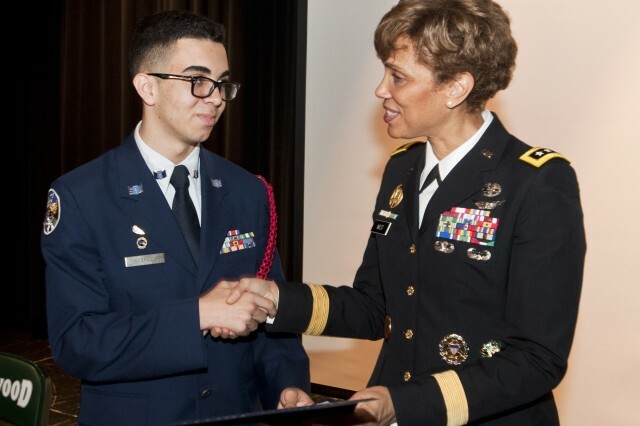 U.S. Army Lt. Gen. Nadja West and high school sophomore Ahmad Perez on the surface might not appear to have much in common, but an interest in medicine brought them together in an unlikely way May 2. 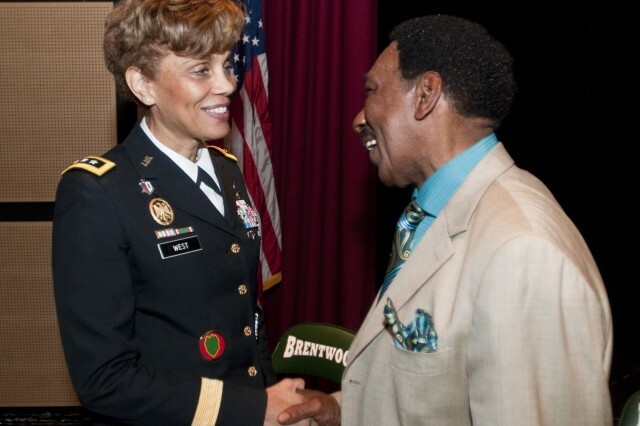 West is the U.S. Army's surgeon general and commander of U.S. Army Medical Command in the Washington D.C. area. Perez, a sophomore at Brentwood High School in New York, is interested in the medical career field. He's also a member of the school's Air Force Junior ROTC program. Opportunity would present itself for them to meet, thanks to Perez' initiative. 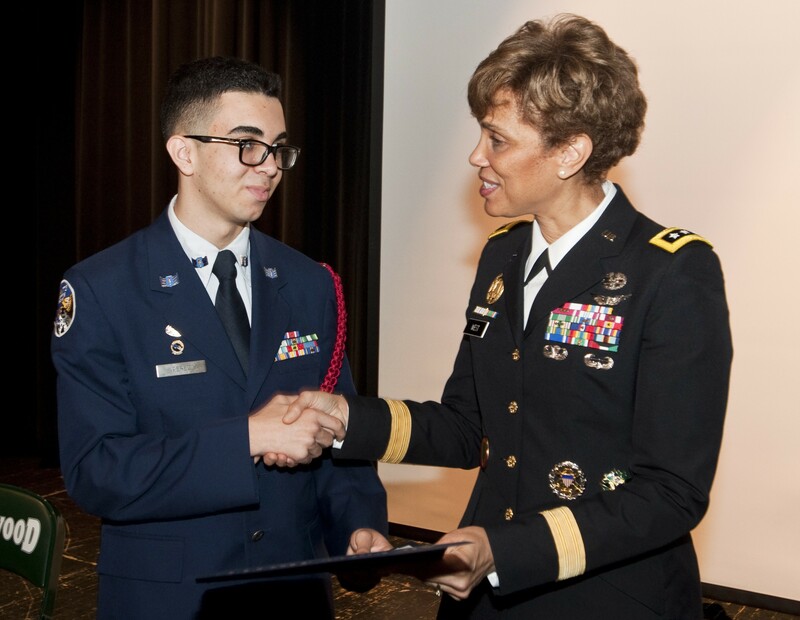 Perez was required as part of his JROTC's college program to research the career he wanted to enter. 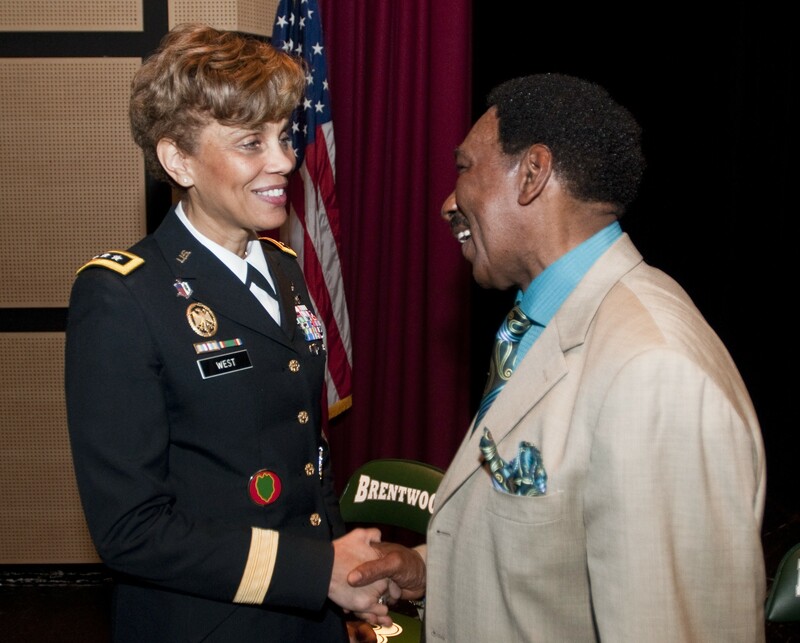 His interest in medicine led him to the U.S. Army's Surgeon General's office -- Lt. Gen. Nadja West's office. He sent her an email to ask her about the medical career field and to talk about his aspirations. "I was delighted to get his email," West said. "I was shocked he was only in tenth grade. He sounded like one of my seasoned Soldiers." The conversation didn't end electronically however. "I wasn't going to pass up an opportunity to meet this really amazing young man," said West, who has been a doctor for nearly 30 years. So, they met at Brentwood High School on Long Island for an interview at the school auditorium. 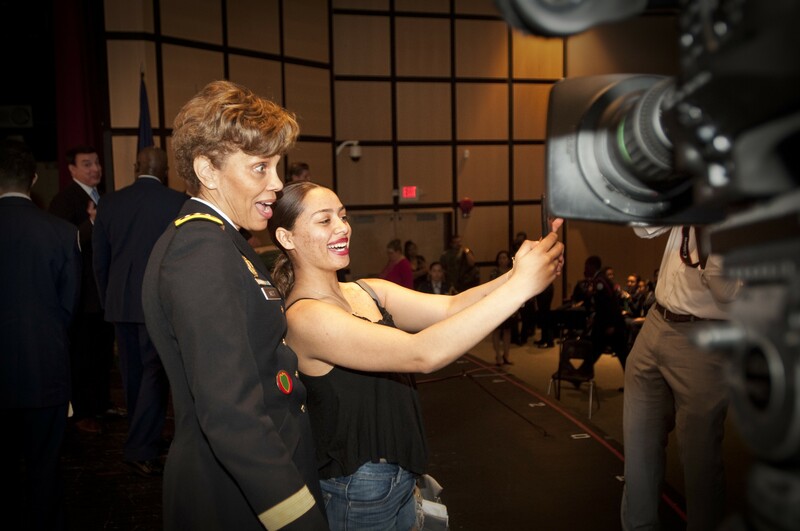 The venue was filled with several hundred teenagers with smiles on their faces, eager to ask questions and meet the career Army officer who is the first African American female to make the rank of Lieutenant General in the Army and the first African American Army surgeon general. "It was really a great opportunity for the kids to meet someone who is such a trailblazer and role model," said John Callan, principal of the Sonderling Center of Brentwood High School. "She gave them the message that you can really achieve your dreams if you put your mind to it." West spent nearly an hour talking about leadership, preparation for success and belief in oneself. Students lined up to meet her, ask questions and take selfies. The inspiration behind her visit, Perez, interviewed her on stage about her life and journey to the top echelons of the Army ranks. Perez said he was really excited when he found out she was coming, and he felt honored to interview her on stage. During their exchange, West challenged the students--more than 80 percent minority--to reach for their dreams. On one occasion, she asked the students to raise their hands if they wanted to go into the medical career field. She asked who among them thought they weren't good enough to go into medicine. Most of the hands stayed up. "That was me," West said, referring to the group with the raised hands. The general said she thought she wasn't good enough to be a doctor when she was young, until a mentor told her to just try. "What would it hurt to try?" she recalled. The mentor said that if she never even applied to get into medical school, then the answer to her being a doctor would categorically be "no." "It starts with belief in oneself," West said. "Have confidence to do it. If it is your dream, go for it." 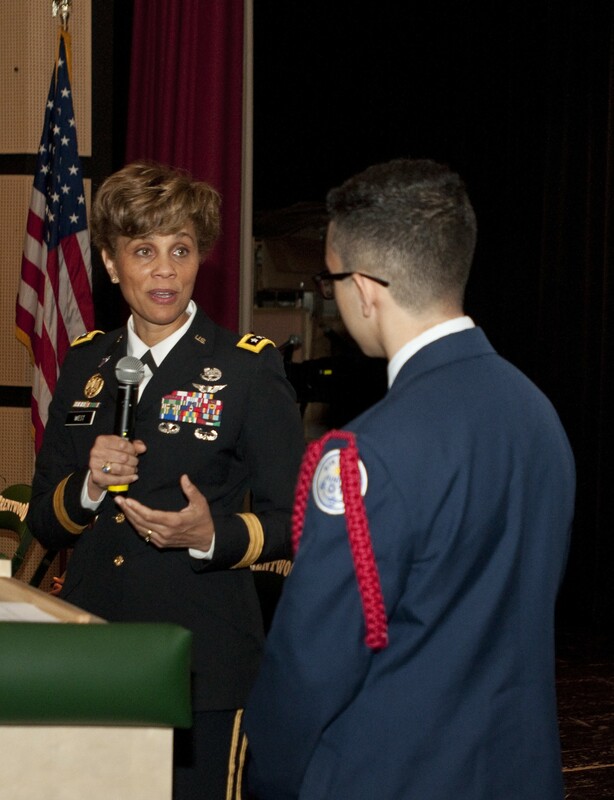 Following a question and answer session, West presented awards to select JROTC students -- to include presenting one to the young cadet who was the catalyst for the event, Ahmad Perez. 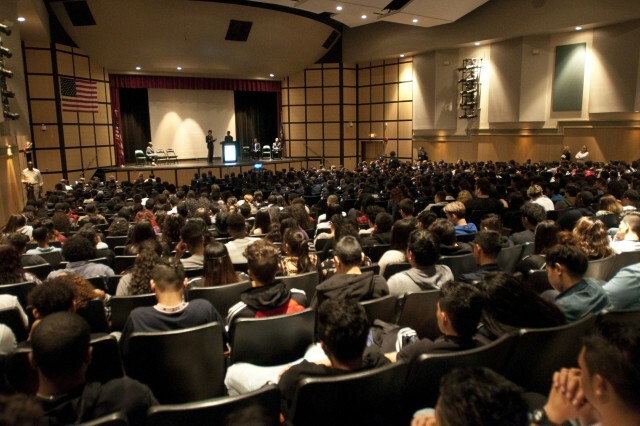 West admitted that visiting high schools is one of the highlights of what she does when she travels, but usually other events are also on the agenda. In this case, the day prior, New York City's Soldiers', Sailors', Marines', Coast Guard and Airmen's club honored her with the Spirit of America Award. Her New York visit also included a meeting with the Business Executives for National Security, where she outlined the current and future state of Army medicine. As for Brentwood High School, Principal Callan said he hopes she comes back. "It was a thrilling visit," he said. "For our students to see someone who represents them so well… it was just such a great opportunity." 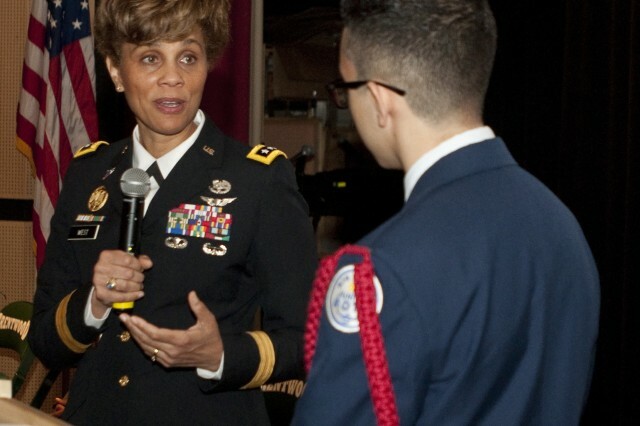 Army surgeon general visits Long Island HS and motivation ensues!